The world's smallest ear doesn't belong to any animal. Instead, it's a tiny piece of gold suspended in a laser beam. 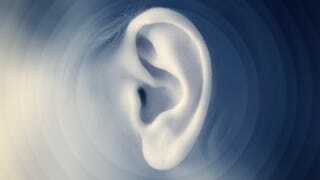 It can hear sounds a million times fainter than any human ear can, making it a powerful acoustic microscope. The nano-ear is the work of Jochen Friedmann and Andrey Lutich of Munich's Ludwig-Maximilians University. The setup is a progression from the 1986 development of so-called "optical tweezers", which use laser beams to trap microscopic particles inside the most powerful part of the electric field. This effectively suspends the particle so that it no longer moves on its own - the only way it can move if something nearby disturbs it. In the case of the nano-ear, that "something nearby" is the vibrations of sound waves that the human ear couldn't possibly detect. The optical tweezers allow the researchers to carefully track and record any disturbance to the particle, and from that they can figure out precisely what sounds passed by the nano-ear and caused the particle to move. The nano-ear is capable of hearing sounds as low as -60 decibels - and because decibels are on a logarithmic scale, that means six orders of magnitude, or a million times lower than the faintest sound we can hear. To test the nano-ear, the researchers placed the gold particle, which is just 60 nanometers across, inside the beam. They then took some other microscopic gold particles and heated them using a laser. The sound vibrations given off by this heating then traveled past the nano-ear. The movement of the particle revealed not just the exact decibel level created by the heated particles, but also from what direction they had come. Admittedly, the nano-ear only worked when placed in a carefully controlled, perfectly arranged environment. For it to be of any use as an acoustic microscope, the researchers will need to come up with a way for the nano-ear to distinguish between sound vibrations and the occasional random movement by the trapped molecule. Speaking to ScienceNOW, Lene Oddershede of the Optical Tweezer Laboratory called the work "very inspiring" and said the inventors likely "can relatively quickly improve the equipment." Physical Review Letters via ScienceNOW and Physics World. Top image by olly, via Shutterstock. Diagram via APS.